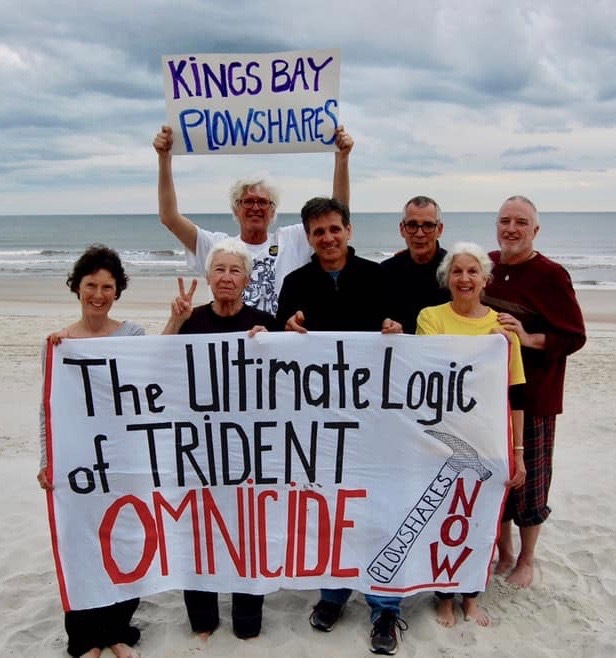 Like most of you who have been supporting and praying for The Kings Bay Plowshares, the seven of us are very surprised that a year has passed since our April 4, 2018 faith witness at (Trident) Naval Station Kings Bay in St. Mary, Georgia. It appears our decision to apply the Religious Freedom Restoration Act to our defense has slowed down the works. We were last in court November 19, and we are still awaiting the government’s response to several of our motions. On the bright side, our lawyers think the delay is a good sign that we have stumped the system by making it work hard to deny us our rights. For the three still inside the Glynn County Jail – Fr. Steve, Liz and Mark – the wait is especially hard. Many say time in jail is two or three times harder than time in prison. (Mark has fully addressed this hardship in his article on our web site.) For those of us on the outside – Clare, Martha, Carmen and Patrick – our lives have been controlled by probation officers who have us under constant surveillance with ankle monitors. This control has led to much anxiety (as Fr. Steve warned it would). While the wait has been difficult, we are all grateful for the efforts of our GREAT legal team and our equally GREAT support teams. We are also grateful to our families and communities that have kept hope alive for the seven of us. We would also like to take this moment to recognize all the different communities and organizations that are working tirelessly for justice and peace. Today we especially want to hold up the work of the International Campaign to Abolish Nuclear Weapons (ICAN) and all the work they are doing to promote the U.N. Treaty on the Prohibition of Nuclear Weapons, and the work of the Nuclear Issues Study Group who are looking at all parts of the nuclear issue from uranium mining to the dumping of nuclear waste done on indigenous lands and how to fight these forms of environmental racism. We do expect to hear back from the magistrate soon, which will get us closer to a trial date … and an acquittal, as our action was an attempt to uphold the highest laws of our land! Thank you for being on the journey with us. It is our sincere hope that by dismantling the triplets of racism, militarism and extreme materialism, one day our children and grandchildren will live in a world without weapons of mass destruction and without war!!! The Plowshares defendants are all life-long Catholic Workers. 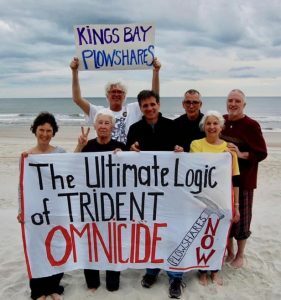 They took these actions to symbolically disarm the nuclear weapons at Kings Bay Naval base because their faith says these weapons, which are designed to exterminate life, are immoral and evil according to the Catholic faith. The Religious Freedom Restoration Act prohibits the government from burdening a person’s sincere exercise of their religious beliefs. The only way the government can interfere with the free exercise of these religious beliefs is if the government both proves that it is necessary to further a compelling governmental interest and is the least restrictive means of furthering that interest. Burwell v Hobby Lobby, 134 S. Ct 2751, 2767 (2014). Thus, the Plowshares argue, the three felony charges lodged against them by the government for exercising their religious beliefs should be dismissed, or at a minimum reduced to the ban and bar letters or misdemeanor trespass.